It has been awhile since I last signed up for one of the always fun, and always challenging International Incident Parties hosted by the lovely Penny at Addictive and Consuming. This month's theme? Sichuan cuisine. Bang! sichuan peppercorns and dried chillies. I love my food hot, I love it spicy. But I've never attempted to cook Sichuan food. 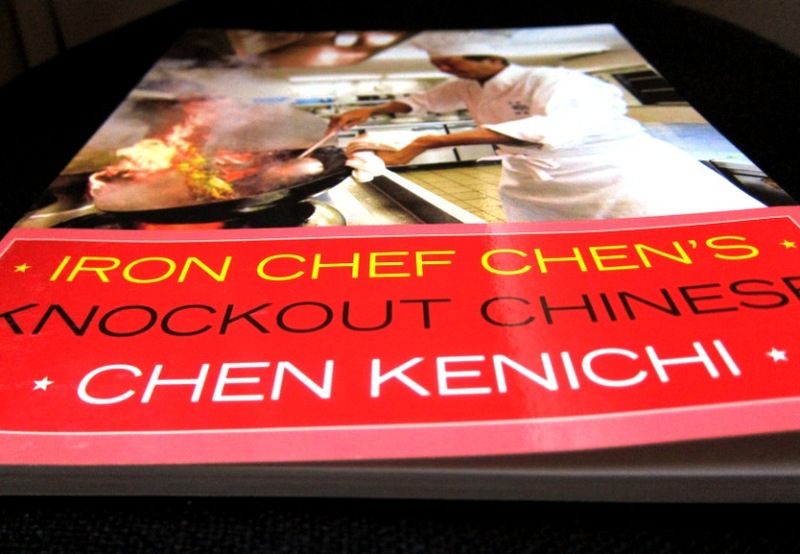 I immediately turned to an impulse purchase I made several months ago - a cookbook by Iron Chef Chen Kenichi, titled Iron Chef Chen's Knockout Chinese. I rarely use cookbooks, and I've never used this one, but who better to take as a guide other than Iron Chef Chen, the sage of Sichuan cuisine? iron chef chen's knockout chinese! Iron Chef Chen's Knockout Chinese doesn't actually feature many traditional Sichuan dishes. However, I did find one for dan-dan noodles. I tweaked a few of the ingredients, swapped noodles for rice, and came up with... an Iron-Chef-inspired dan-dan congee. Wash, rinse and drain rice a few times. Bring rice and water to boil in a pot, then simmer, partly covered, for about 45 minutes or until it reaches your ideal texture and consistency. During this time, stir regularly and add more water if necessary. Heat up peanut oil in a pan, then throw in Sichuan peppercorns, dried chilli and ginger. Let it cook gently for 2 minutes or until ingredients are starting to turn brown and the oil takes on colour and flavour. Strain the oil, and whisk with the rest of the ingredients until well-combined. 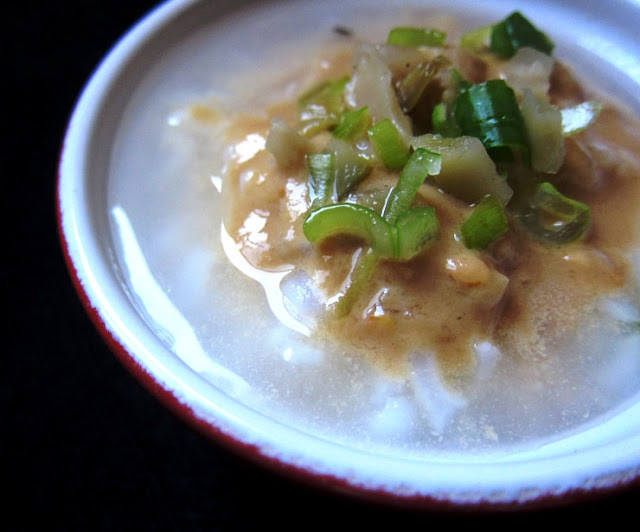 Drizzle onto congee and scatter with more spring onions and preserved vegetables. *You should be able to find all these ingredients in a comprehensive Asian grocery store. I've never bought zha cai before but I picked up a brand called Yuquan, which comes in a green packet, and I think it worked nicely. If you can't find Chinese sesame paste, you can try mixing 3 parts tahini or peanut butter with 1 part Chinese sesame oil. I was pleased with the dan-dan sauce - full of sass and flavour, it was a perfect pairing to plain congee. The fragrant Sichuan peppercorns and dried chillies imparted a gently numbing heat; the zha cai was salty and pungent. The nuttiness of the sesame paste was lightly offset by the acidity of the rice vinegar. Everything worked together, and they worked with the congee to create a humble, warmly inviting dish that added a little perk to my day. A satisfying success! go get your spice on! Your congee looks really velvety! And zha chai is one of my favorites. hehe. I've never tried Sichuan food, but I think I won't be able to handle their spiciness! Your congee looks amazing, it would be so flavoursome too. Great pics! I am having trouble uploading the Linky to my post, I have copiedand pasted the script. Are there any tricks to it?? That looks so comforting! I love congee as hangover food, the spice would make it even better. 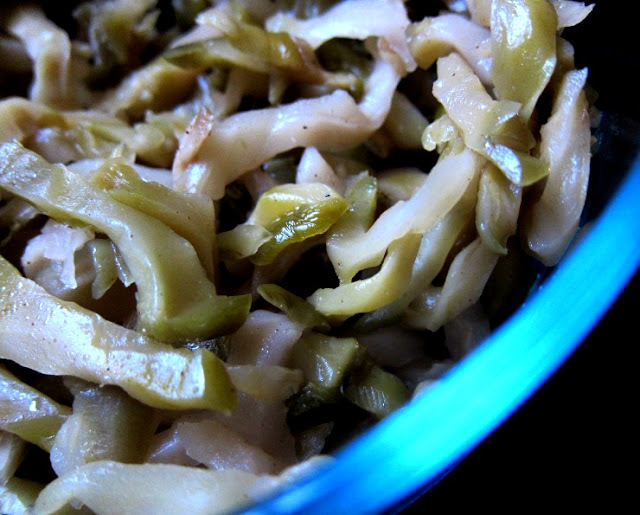 Miss Adriennely, there's more to Sichuan food than just heat and spice - give it a go! Gourmet Getaways - thank you! I've had no troubles getting the script to work - I just copied and pasted under the Edit HTML tab in Blogger. Thanks Foodycat! Yeah I always go to congee when I'm feeling under the weather. So soothing! Oooh I love the idea of this dish - looks like a great big old bowl of comfort! I love a good old dan dan noodles but never had the sauce in congee.... NOMz. And thanks for participating this month. This is BRILLIANT! Congee is one of my most favourite dishes, though I doubt I've ever made an authentic one, generally throwing in spinach, smoked trout, ginger chilli... :P Will definitely need to try this! Where did you get the cookbook?!?! I want I want! You know Iron Chef Sakai, he used to be an executive Chef in Perth Intercontinental hotel. I found out years later, after I moved away from Perth... One day he called me, caused I was the youngest executive chef in WA in Intercontinental too. That was an awesome experience. Of course your food looks awesome Leaf!! With the wholesome sesame paste and everything salty, spicy and tangy! PFx - I bought it off Book Depository, you should be able to find it at most online bookstores. It might be a bit too lightweight and basic for you though. How awesome about Iron Chef Sakai! You sir are a very impressive young man. A spicy, salty, pungent congee...it sounds so wrong but in Sichuan cuisine, I know it tastes so right! Love your use of spices and zha chai as toppings for the congee. I too love the theme this month, Szechuan food is so much fun to cook and eat. I also LOVE spicy food. This is a cool dish you've made! Thanks Foodiva - so true, it's all about those bold flavours! Voltei... a aparência do prato é muito apetitosas! Spicy congee! Wow, never had that kind of congee before. I haven't had zha cai for years! So nice even on its own. Such a great congee. I made myself a congee last week due to a bad cold with a load of garlic and ginger. Looks great! 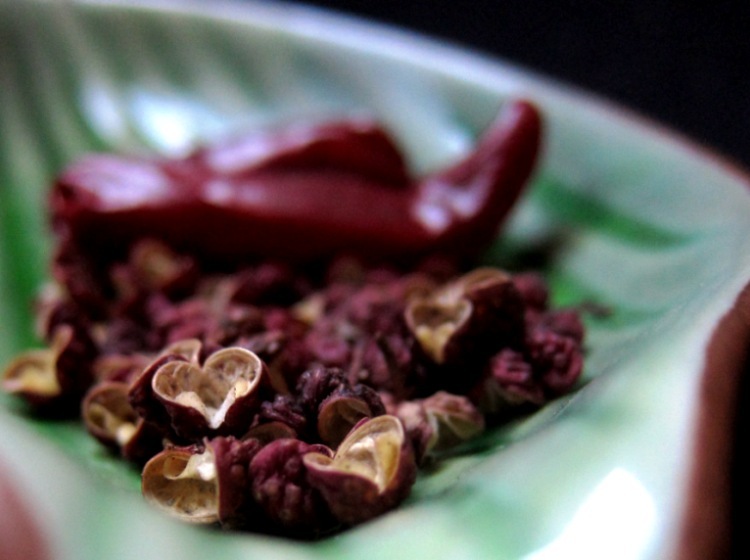 I love the first shot of sichuan peppers... gorgeous colour! chopinandmysaucepan, I agree - it is quite nice to nibble on a little at a time! Adrian, your congee sounds great too! Bring on the garlic and ginger. Thanks for coming by chinmayie, happy that I acquainted myself to your blog too, it's lovely! More sauces should have sass. Love the recipe- and the descriptions. This sounds so exotic to me! Those peppercorns are beautiful! Oo this looks delicious! I love Sichuan food but I've never tried to make it at home before, this is inspiring me to give it a try.